Cebu Pacific, the country’s leading carrier recently launched their newest route. 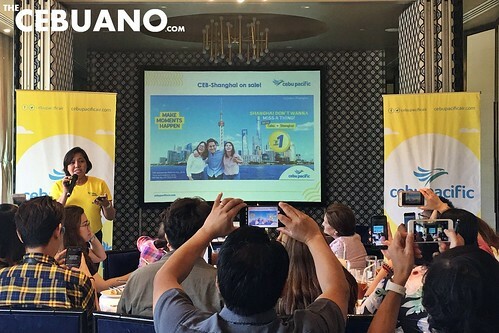 As a direct response to increasing demand, Cebu Pacific decided to boost its route network with a direct service between its hub in Cebu and Shanghai in China. The launching sale ran from March 22 to 30, 2019. The launch was announced through a Cebu-Shanghai seat sale where tickets were sold for as low as PhP1 base fare from March 22 to 30. Travel period for this promo was from April 15 to September 30, 2019. 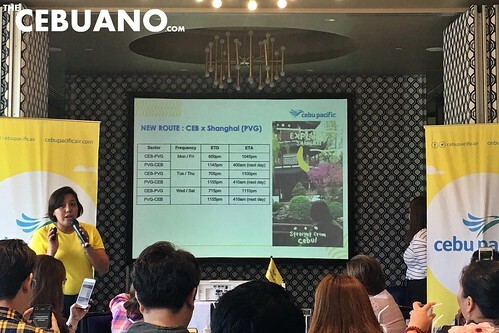 Cebu Pacific will be flying to Shanghai from Cebu (and vice versa) six times per week. There are a lot of interesting things to see and do in Shanghai. Shanghai, which is only four hours away from Cebu, is one of the most popular tourist destinations for Filipinos. Pinoys visit Shanghai for different attractions and features like the Huangpu River, Shanghai Disneyland, and the historical Yuyuan Garden, among others. Cebu Pacific has seven strategically placed hubs in the Philippines: Manila, Clark, Kalibo, Iloilo, Cebu, Cagayan de Oro (Laguindingan,) and Davao. In 2018 alone, Cebu Pacific flew around 20.3 million passengers on more than 2,130 weekly flights across 37 domestic and 26 international destinations. 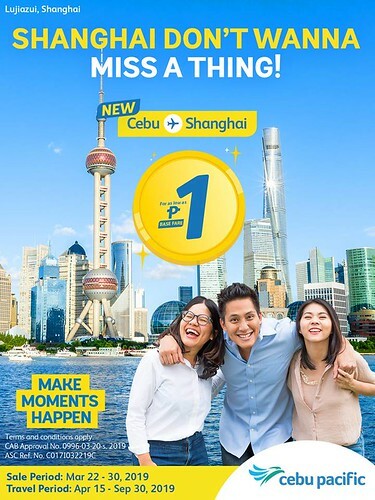 To book your Cebu-Shanghai tickets, visit https://www.cebupacificair.com/ today!